For the 61st time since 2011, Congressional Republicans are moving legislation to undermine and dismantle key elements of the Affordable Care Act (ACA). This time, though, will be different. Second, this will be the first time that the House and Senate both pass similar legislation to damage the law. As a result, this will be the first time that anti-ACA legislation will reach President Barack Obama’s desk. The President’s veto of this measure is guaranteed, as are the needed votes in the House and Senate to sustain his veto. 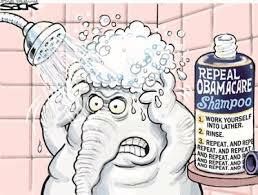 So this will be another exercise in ObamaCare-Kabuki Theater with some new twists. What’s In The Reconciliation Package? Does any of this matter? Yes it does, because the selection of matters included and excluded offers insights into current Republican thinking about the future of the ACA, especially if the Republican Party controls the White House, Senate, and House in January 2017. 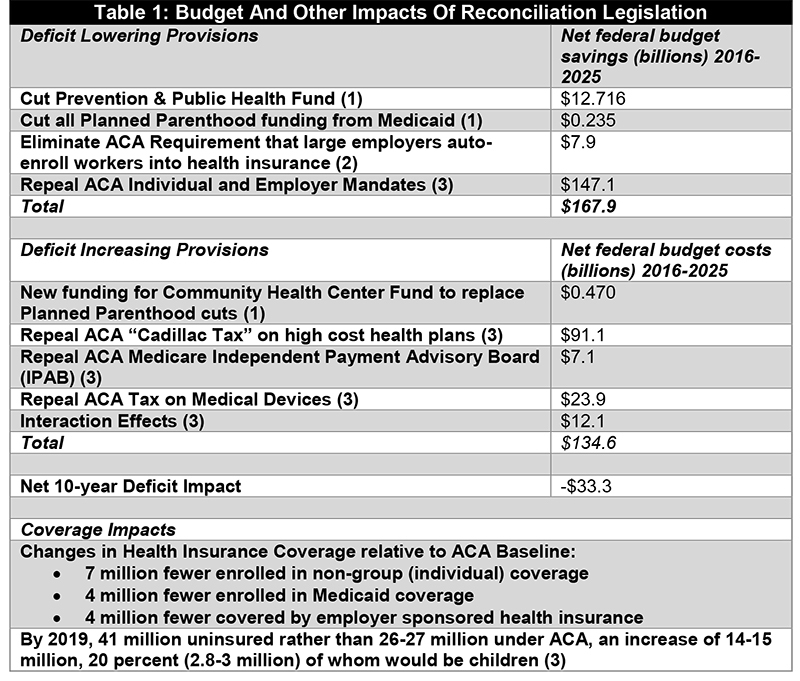 The table below is a list of the legislation’s targets, divided by items that save federal dollars and items that cost federal dollars, as newly calculated by the Congressional Budget Office (CBO). The only non-ACA matter is the cut of Planned Parenthood funding from Medicaid with a related insertion of funding for the Community Health Center Fund to replace the cut to Planned Parenthood. Source: Congressional Budget Office estimates of reconciliation bills approved by: (1) House Committee on Energy & Commerce; (2) House Committee on Education & the Workforce; and (3) House Committee on Ways and Means. After more than five and one half years since President Obama signed the ACA, Republicans offer nothing in the bill to replace what would be lost were the changes to the ACA to become law. According to the CBO, between 14 million and 15 million Americans would lose the coverage they now have, including approximately 3 million children. Yet no replacement is in evidence, after five and one half years of replacement promises, most recently from House Ways and Means Chairman Paul Ryan (R-WI) last March. It is noteworthy that the legislation neither eliminates nor reduces the ACA’s private insurance subsidies, nor does it reverse the expansion of Medicaid eligibility. Does this indicate a new reluctance on the part of Republicans to alienate between 16-17 million formerly uninsured individuals now with coverage because of the ACA? Is there a grudging acceptance of the inevitability of the Medicaid expansions among Republicans in Congress because more and more Republican-leaning states are now expanding Medicaid? Also noteworthy is the elimination of the so-called Cadillac tax on high-cost health insurance policies, as well as proposed demise of the yet-to-be-formed Independent Payment Advisory Board that has authority to reduce excess Medicare spending in the absence of Congressional action. Of all the cost-control measures included in the ACA, these two are recognized as among the most potent and efficacious. Just this past week, more than 100 U.S. health economists jointly signed a letter urging Congress to uphold the Cadillac tax. If the primary goal of Republicans is to control the cost of health care, it is curious to see the elimination of these two mechanisms with no proposed replacement. While Congress advances this legislative bridge to nowhere, it also quietly approved new legislation last week to eliminate the ACA’s expanded definition of small employers from 50 to 100 employees, a bill all sides knew President Obama was prepared to sign. Comparing the two initiatives makes clear that the Reconciliation legislation is primarily for political show – for now. But this should not lull ACA supporters into believing that Republicans would not move legislation they believe would become law – perhaps after the next election — that would eliminate insurance coverage for many millions of Americans. How specific do Republicans need to be before we recognize that they are serious in their determination to take down this law, with or without any replacement? Previous Previous post: What Would Republicans Do Instead of the Affordable Care Act?